On the eve of the penultimate presidential debate, a new TIME/CNN poll shows John McCain still struggling in states won by George W. Bush in 2004, a sign that last week's vice-presidential debate had little effect on voter opinion. 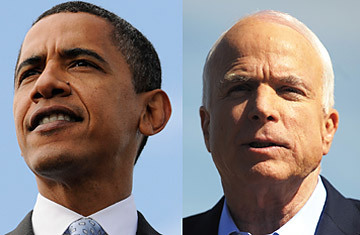 In North Carolina, which Bush won by more than 12 percentage points in both 2000 and 2004, McCain and Obama are locked in a dead heat, with each candidate garnering the support of 49% of likely voters. In Indiana, which Bush won by 21 points in 2004 and 16 points in 2000, McCain maintains a slight 5-point lead over Obama, with 51% of likely voters, compared with Obama's 46%. In the crucial swing state of Ohio, which Bush won by slight margins in both 2000 and 2004, McCain trails Obama by 3 points, with the support of 47% of voters, compared with Obama's 50%. Obama also holds a statistically significant 8-point lead over McCain in New Hampshire and a 5-point lead in Wisconsin, two states that Democrat John Kerry was able to win in 2004. As a result of the new survey, CNN now considers New Hampshire and Wisconsin to be Obama-leaning states, after previously being considered toss-ups. North Carolina is now considered a toss-up, after previously being categorized as a McCain-leaning state. The polls were conducted between Oct. 3 and 6, after last Thursday's debate. They have a margin of error of +/- 3.5 to 4 percentage points. Last week, the McCain campaign reacted to a polling downturn by shuttering its operation in the state of Michigan and redistributing staff to Pennsylvania, Wisconsin and Maine, where electoral votes are distributed by congressional district. In a conference call last week, Mike DuHaime, the McCain campaign's political director, acknowledged that the national mood and Obama's deep pockets had put previously solid Republican states like Indiana in play. "I do think just the overall environment right now that we face is one of the worst environments for any Republican in probably 35 years," DuHaime said. "Any time you have that, you have states move within that margin." After two grueling years, only two major events remain in the 2008 presidential campaign: a town-hall forum Tuesday in Tennessee and a debate on Oct. 15 in New York. In a nod to the dwindling window of opportunity, McCain again sharpened his attacks on Obama during a stump speech Monday in New Mexico, charging that Obama harbors a "back story" on every issue that needs to be explored. "All people want to know is, what has this man ever actually accomplished in government? What does he plan for America?" McCain said. "In short, who is the real Barack Obama? But ask such questions and all you get in response is another barrage of angry insults." Campaigning in North Carolina, Obama countered by charging that McCain and his aides were "gambling that they can distract you with smears rather than talk to you about substance."